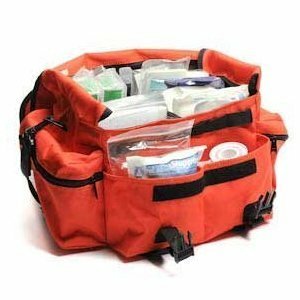 Great for Earthquake, Tornado, and or Natural Disaster Preparedness Kit. NEWLY UPDATED CONTENTS 2015, KIT CONTAINS. 1 Blood Pressure Cuff, 1 Stethoscope, 1 Scalpel, 5 Non Adhering Pads 2×3, 5 Gauze Pads 3×3, 2 Cold Pads, 1 1oz Eye Wash, 1 4 oz Saline Eye and Skin Solution Flush, 1 Penlight, 1 Emergency Blankets, 1 Utility Lister Scissors, 1 CPR Pocket Resuscitator, 1 Instant Glucose, 10 Splinter Outs, 5 Burn Gel, 1 Cohesive Self Sticking Roll Bandage 3 inch by 5 yards, 1 First Aid Adhesive Tape, 2 Gauze Roll 2 inch, 2 Gauze Roll 4 inch, 1 Triangular Bandage, 1 Multi Trauma Blood Stop Dressing, 1 First Aid Guide Book, 1 Surgical Dressings 5×9, 10 Ammonia Inhalants, 2 Pair Nitrile Exam Gloves, 25 Cloth Elastic Bandaid Strips, 25 Plastic Bandaid Strips, 13 X-large Patch Elastic Cloth Bandaids, 20 Knuckle Elastic Cloth Bandaids, 12 Fingertip Elastic Cloth Bandaids, 4 Oval Eye Pads, 12 Triple Antibiotic Ointment, 10 Antiseptic Wipes, 25 Alcohol Pads, 25 Hand Sanitizer, 10 Sting Kill Wipes, 10 PVP Iodine Swabs . Please Review Our Accurate Pricing, Photo, And Description Policy.